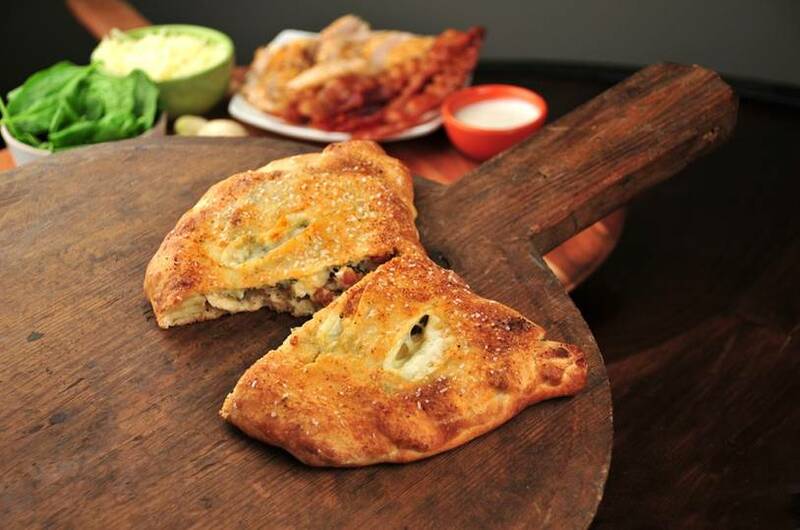 DeIorio’s Dough Flat is a convenient option to create a delicious calzone. Using a thawed dough flat, ingredients are placed on one side of the flat, then the dough is folded over creating a pocket, edges are sealed, slashed to vent, then baked. Place dough flat on pizza peel or baking sheet. Place chicken on bottom half of dough flat, leaving room at edges to seal later. Sprinkle bacon pieces over the chicken, drizzle with Ranch Dressing, add baby spinach, then top with grated mozzarella cheese. Fold the untopped dough over the ingredients, covering the ingredients, press or crimp edges to get a firm seal. Slit the top of the calzone with a sharp knife to create a vent for steam. Brush with oil, then sprinkle with granulated garlic and salt. Place in 450° oven, bake 15 min or till golden brown. Serve with additional ranch dressing. Deliziso! *For a spicy Calzone:Try mixing some hot sauce with the ranch dressing.